The California Pizza Kitchen is not getting great reviews on Urbanspoon. The reason may just be that their most noteable entree option – pizza just isn’t that great. On this Valentine’s day weekend, TasteBudA and I decided to see if we could figure out why the reviews were so poor. Arriving not overly hungry, we decided to split a White Pizza. While ordering, the server suggested added bacon topping, which seemed like a good idea. The nicest part about the pizza was the bacon. The pizza was well cooked, but lacked in flavor. Even the spinach and cheese on the pizza seemed bland. The bacon may have partially saved the pizza, because of its smoky flavor and nice crisp texture. Each 10 inch pizza ranged from about $10-$15 depending on the topping combinations. 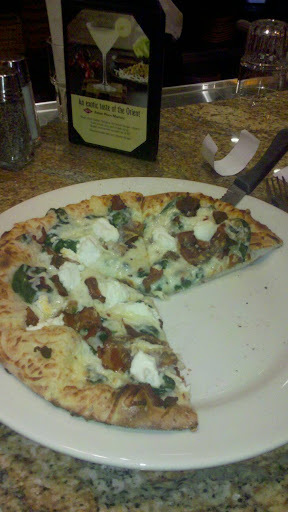 California Pizza Kitchen is one of many food options at Ross Park Mall. It is a full restaurant located outside the food court and does well attracting shoppers because it is a fresh new option to the other fast food options in the food court in addition to the adult beverage offerings. CPK doesn’t serve only pizza though. It’s pleasant atmosphere may draw us back should we find ourselves shopping in the future. We just now know to try some of the other entrees on the menu. They seemed to look more tasteful than the pizza as they were paraded to the other hungry Valentine’s Day shoppers.